One of the most interesting aspects of the G.I. 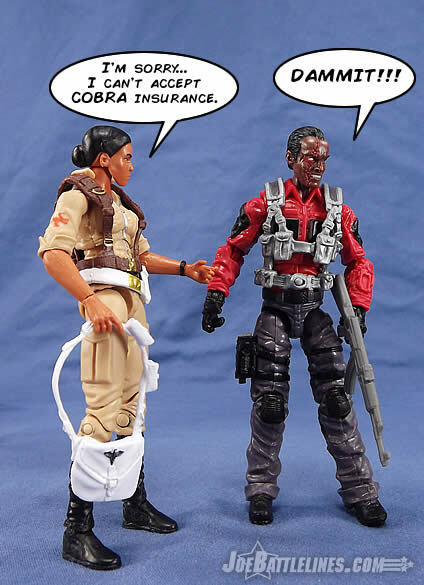 Joe Collector’s Club Figure Subscription Service is the “bonus thirteen figure” included in each roster. The Club offers few clues and so fans are left speculating for months about just which character will arrive in that final box. In the age of the internet and social media, this kind of surprise is refreshing and it helps to spur some discussion in the fan community. This year the Club did drop one hint—the 13 th figure was a female with a brand new head. 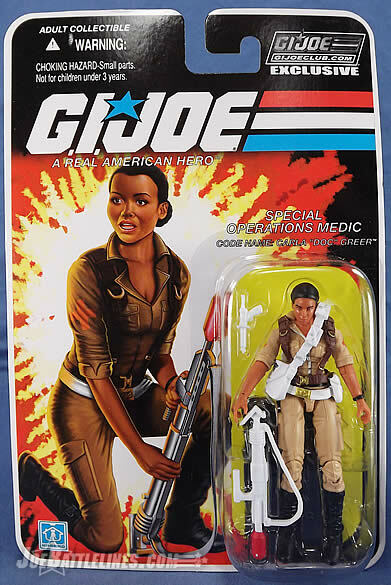 Fans immediately speculated that, based on the appearance of Tiger Force Jinx in the GIJCC magazine comic, she’d be our bonus figure. We were wrong. Fred, I gotta admit this one was a surprise. Since it was announced G.I. Joe Extreme’s Steel Raven would appear in FSS 5, I was certain the mystery 13 th would be Dr. Knox. After all, it made perfect sense! Tool lab coats at the same time for her and Dr. Biggles-Jones, possibly use the new head coming with Synthoid Arcee to maximize tooling, and because it would help round off Cobra’s scientific caste leaving only Hotwire to be made. 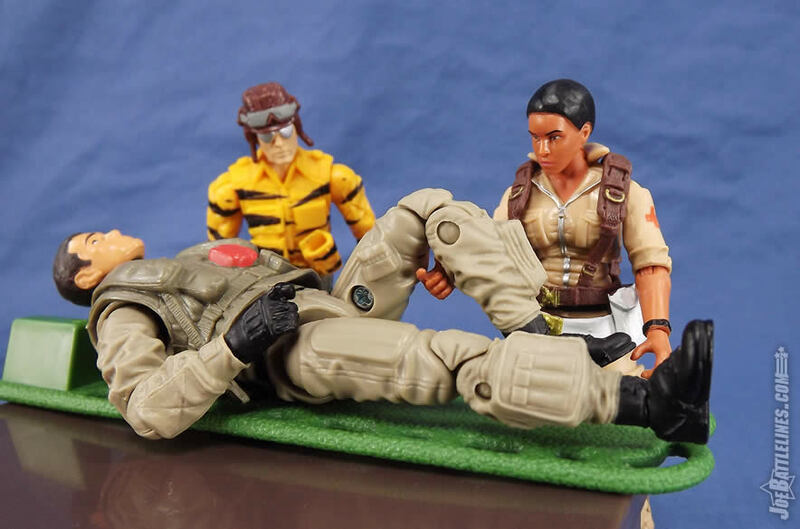 Of course, when I began to hear “absolute certain” speculation from alleged “insiders” it was Tiger Force Jinx; I grew despondent because I’m sick of Tiger Force---especially in Cringer colors . Needless to say Carla Greer is a most welcome surprise, and a great looking figure to boot! 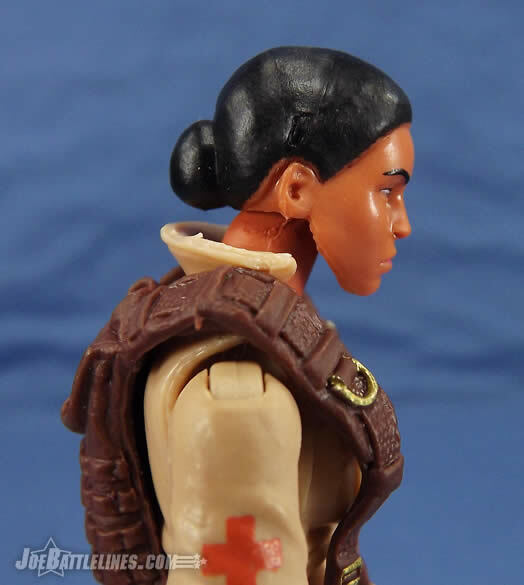 First and foremost Doc comes with a beautiful new head sculpt, and fans can rest assured it is not the same head used for the upcoming Shooter. The sculpting and design of her portrait is very well done, but it suffers from one flaw: it’s very small compared to others like Helix, Pilot Scarlett, or even Pythona. 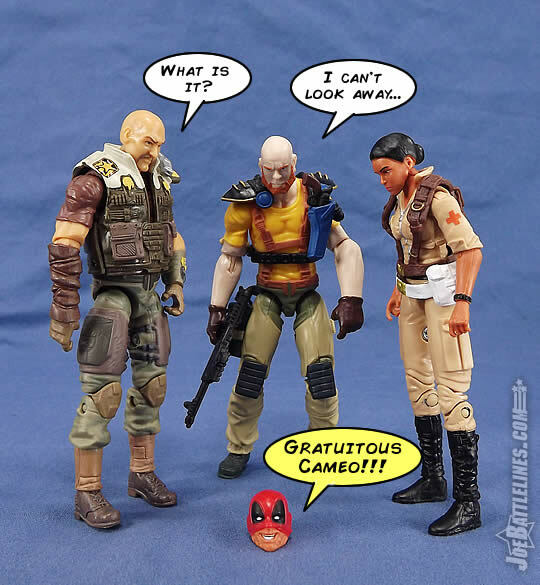 The only modern female head that is smaller; is the outrageously tiny FSS Jinx head. But like with what saved Oktober Guard Daina, is, Doc’s body is shorter and leaner, and her high collar helps draw attention away from it. She also has the benefit of looking good standing alone. 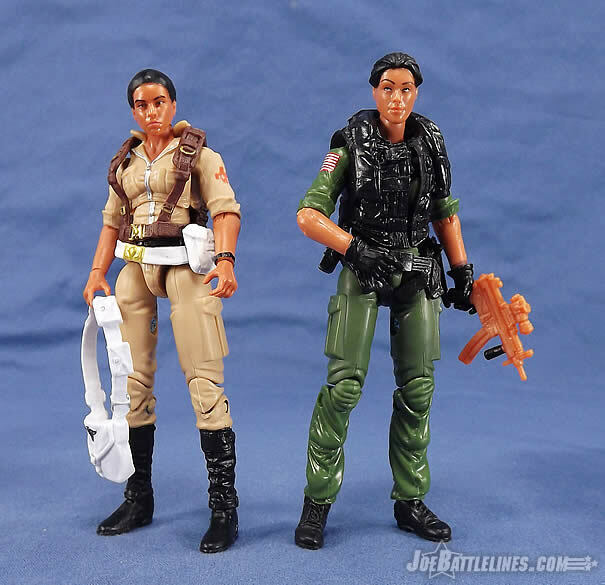 But the proportion issue really becomes apparent when you stand her next to someone like Bombstrike. But this isn’t a deal breaker as small heads are very common to G.I. Joe. (And to be honest, I’d prefer a head that was a tad too small than one that was too big, as was the case with some of the other recent females by Hasbro and the Club.) I’m actually really impressed with her tight jawline, and she has a great intense stare. If I had to mention something else that could have been improved upon, it would be the texture of her hair. It is completely smooth with the exception of a styled bun, but that is also smooth. Regardless, the solid black coloration helps to make the hair unified and aesthetically pleasing even if it doesn’t have any raised or recessed detailing. Fred, the head also seems to sit low on the neck. Is that the case, or is it just an optical illusion because the neck is sculpted hunched forward and her jumpsuit’s collar is raised? Chris, it’s not a trick of the eye or even the lens. Instead, the odd cant of the head is a result of the unfortunate trend of sloped necks that plagued the line at one point. 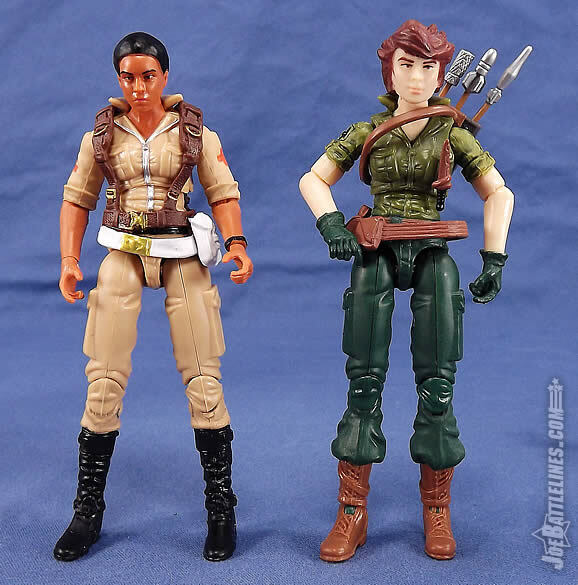 As such, poor Carla is always looking down a bit, just like the PoC Recondo and the Slaughter’s Marauders Taurus figure. I don’t understand the logic of this design decision—is it meant to better reflect the posture of the human body? If that’s the case the angle is just too exaggerated at this small scale. However, there’s not much we can do about it at this point. 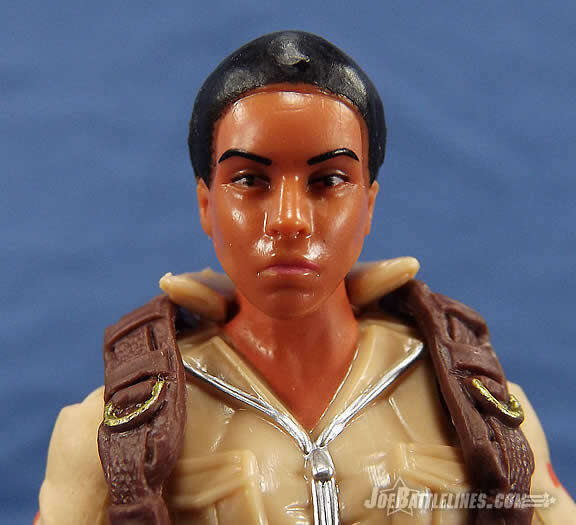 Next we come to her torso, which is borrowed from the 25 th 5-pack Lady Jaye. While an understandable choice, it isn’t perfect, as the torso is very short compared to the longer RoC Cover Girl legs. It doesn’t look too bad when her webgear is off and the tan of her jumpsuit melds her body together, but the disproportion is noticeable when she is geared up---especially at how high her belts rest on her waist and abdomen. Lastly her arms are also lifted from RoC Cover Girl. No real issues there, except perhaps some difficulty holding weapons with wider grips. It’s funny—I noticed that her legs were a bit long when I was posing her kneeling next to the flare launcher. I thought it was just me but they are a bit long. It’s not really all that noticeable when she’s standing however. As for deco, it is a very nice homage to the 2007 Tanks (but no tanks) For The Memories convention set in which she debut, with the only real difference is this time she has bare arms, while her O-ring version had tight Under Armour sleeves. The Club also did a good job on some of the smaller details, like the silver buckles on her webgear, and the zipper track of her jumpsuit. I was also impressed with the red cross patches on her uniform. Although this is the accepted international NATO symbol, Hasbro got a bit too PC in the past, and switched over to the “circle” symbol used by Lifeline and Stretcher. It’s good to see the proper emblem back. I agree—the deco here is quite solid. The Club made some subtle changes such as giving her web gear a darker hue rather than the white tone used on the 2007 version but I like it. It’s a solid color scheme that both evokes the design of the original Doc as well as serves to give Carla her own unique identity. Full marks all around! 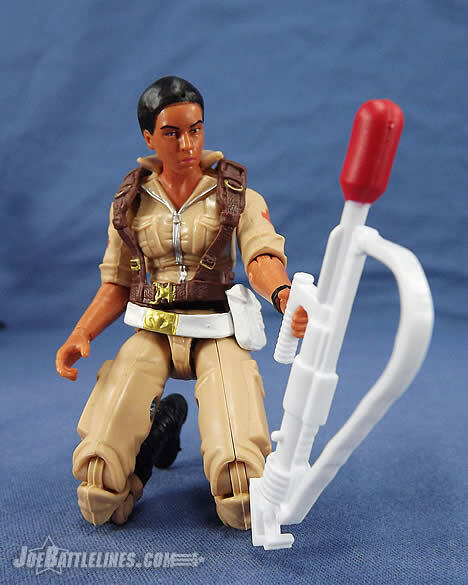 Doc comes with the same mortar as male Doc (listed as a “rescue flare launcher” on his original filecard), a tranq gun, and wearables consisting of a belt, webgear, and a medical kit. Nothing special, but role appropriate. 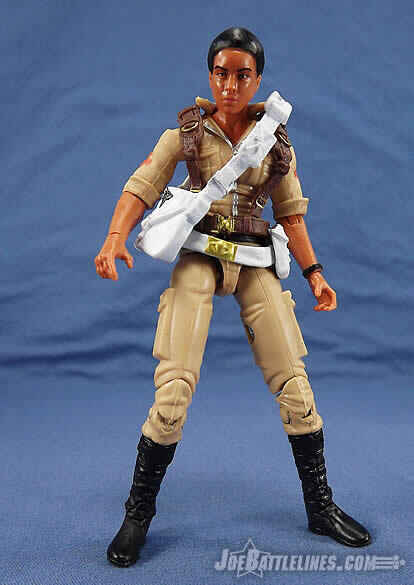 Again, Carla Greer’s kit is very evocative of her uncle’s which is logical for an homage character. 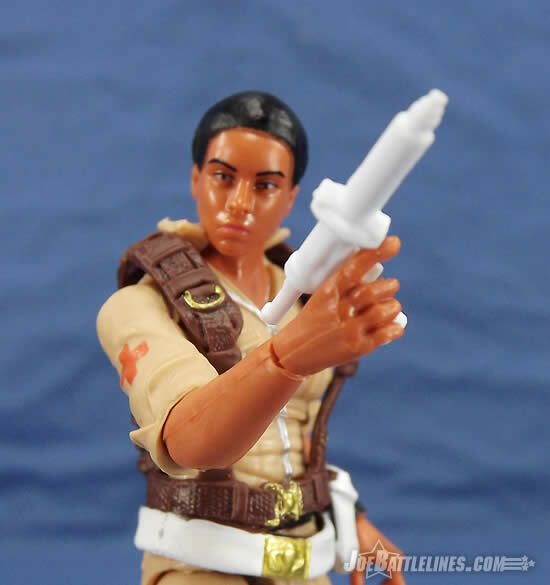 I like the inclusion of the injector/tranquilizer gun even if the figure’s hands aren’t really designed to hold it in anything other than a very loose grip. I do find that the shoulder satchel feels a bit bulky on this particular build and I’ve ended up leaving off of the figure far more than I’ve left it on. Just give it to Lifeline, as it would match his uniform perfectly. All-in-all a nice kit for a figure that is a direct nod to a previous classic character. I would also like to mention her filecard. On one hand it was cool seeing her in a mirrored pose of the original Doc, but on the other hand I have a big problem with her being listed as another pacifist. Sorry, but that’s utter bunk. It’s a romantic notion to be sure, but completely devoid of all fact. 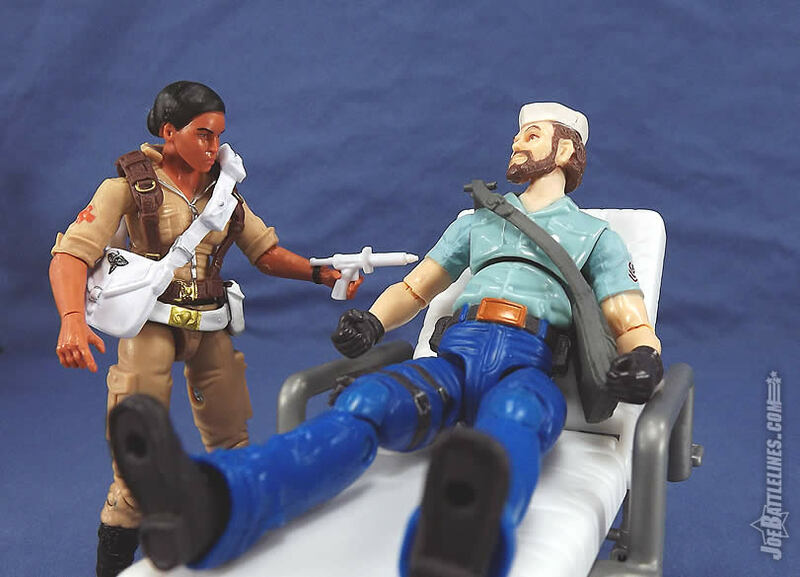 In the modern U.S. military, a SpecWar medic is a shooter (no pun intended) first; and carries a primary and secondary weapon in case they need to defend themselves or a patient---or if they need to pass their weapon off to someone else if they need to perform medical attention. The first phase of the TCCC paradigm is composed of two verbs: care and fire. This implies the unpleasant realities that one’s unit has come under attack by hostile personnel who have made the unit the target of effective fire by one or more lethal weapon systems, and, as a result, someone has been wounded. The essential initial action is to return effective fire toward the threat with the specific intent of neutralizing or otherwise preventing hostile personnel from continuing to place effective fire on the CCC provider or their unit. Until this is accomplished, the CCC provider will be unable to render effective medical care, and the careprovider, fellow warfighters, or existing casualties could be further wounded or killed. 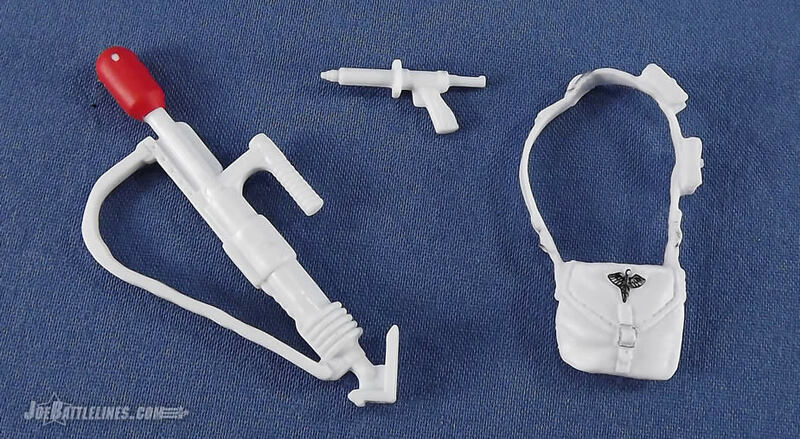 In care-under-fire situations, the CCC provider should return effective fire, move the casualty to a safe area, rapidly assess the casualty for sources of massive extremity hemorrhage, and apply a tourniquet if necessary. So as we can see, Carla (and Lifeline, and even male Doc is he is still alive in your individual Joeverse) cannot be a pacifists and still be on the ‘Joe team. If one is going to try to get credibility by citing real world military acronyms on filecards (AMEDD for example), one should also make sure they also do their homework everywhere else. Also, for those who want to read first hand see what real-life combat medics do, they should check out: Saber's Edge: A Combat Medic in Ramadi, Iraq by Thomas A. Middleton. Fred, I’m very happy with this one! 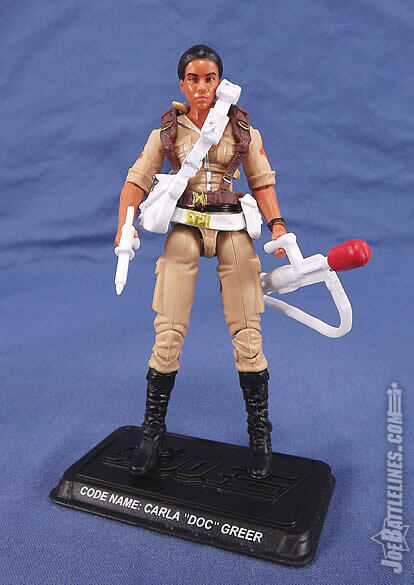 While Doc has a few distractions here and there, overall she is a beautiful figure and a perfect addition to the FSS---a new character with a new head. 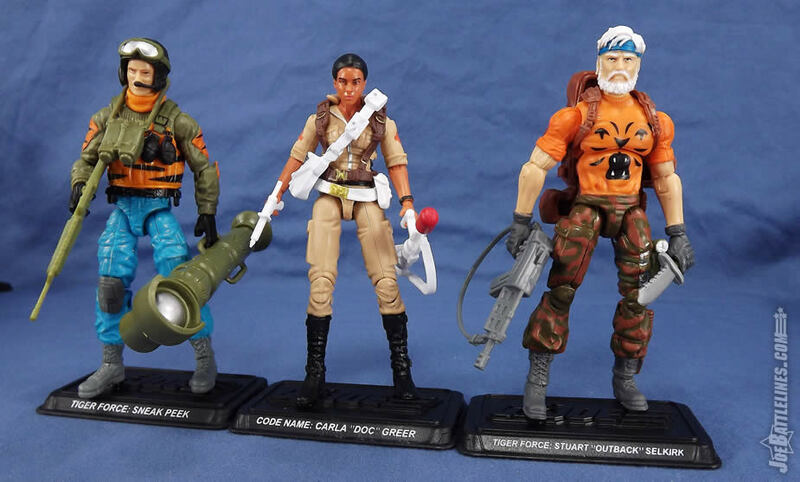 Like with Pythona, Doc is a must-own figure for all collectors! I’ve said it before and I’ll say it again—I love it when NEW characters are added to the G.I. 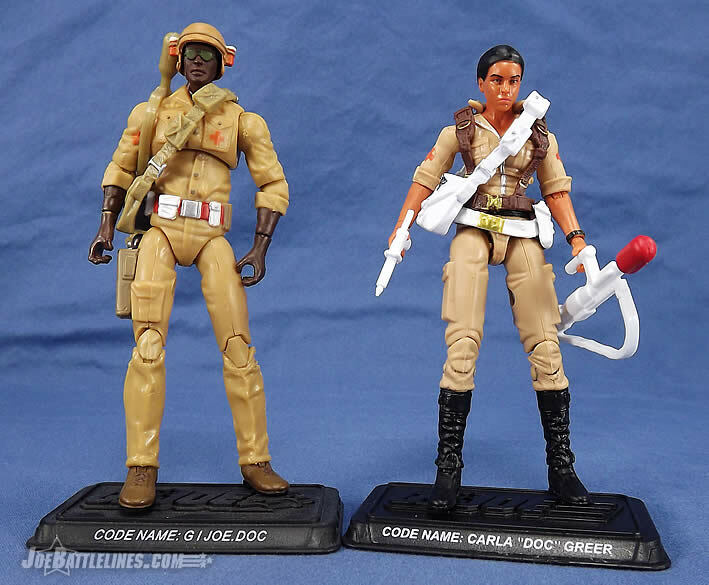 Joe mythos and Carla “Doc” Greer is no exception. 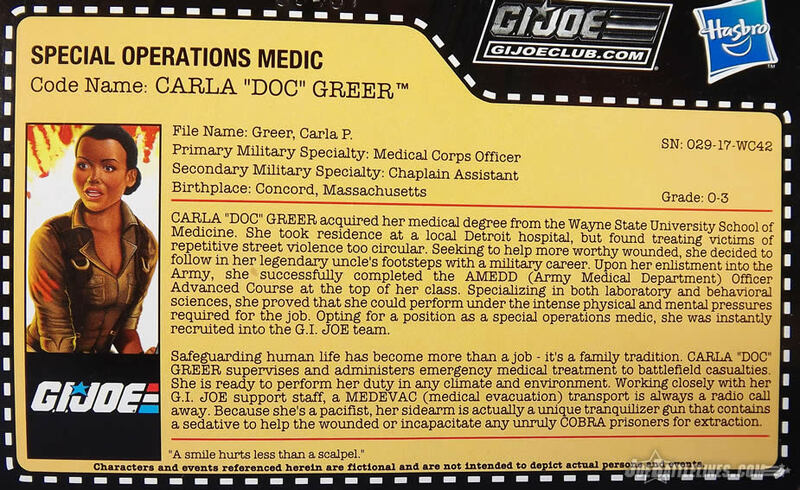 Sure, the text of the file card, file name, and uniform design combined do seem a bit heavy-handed but there’s still enough there to make Carla Greer “Doc” in her own right. The design of the figure is very evocative of the original Tanks for the Memories 2007 release and the new head is a VERY welcome addition. I’ll be blunt—I didn’t see this one coming and the GIJCC really stepped up their game this time, especially after some past 13 th figures weren’t all that impressive. 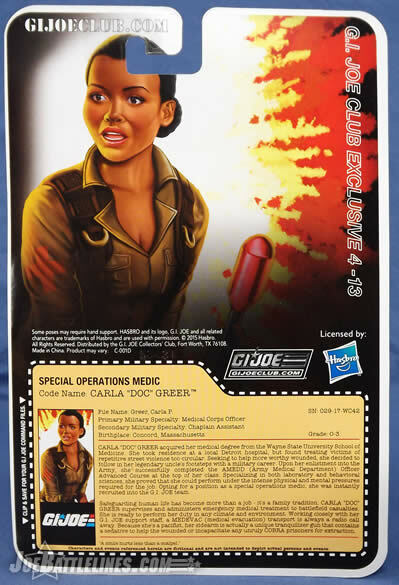 Carla Greer is a welcome addition to any modern G.I. Joe collection and I’d suggest snagging one of these now before the prices go through the roof on the secondary market. Of course, that’s just this Joe fan’s opinion. 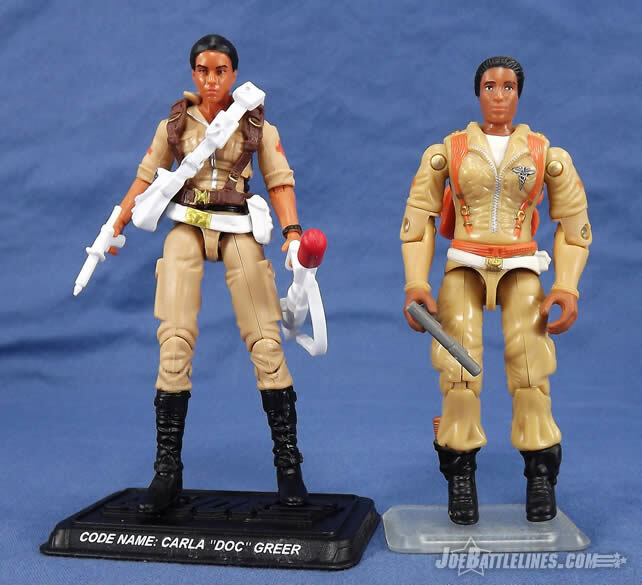 The Bottom Line : Carla Greer is a solid update to the Club-created 2007 figure with a snazzy deco and a solid brand-new head sculpt. In spite of some odd construction issues, she’s still a worthwhile purchase!